New year, new ROCKstar! This month’s honoree is Evan Guffin, one of our Lead Technicians. 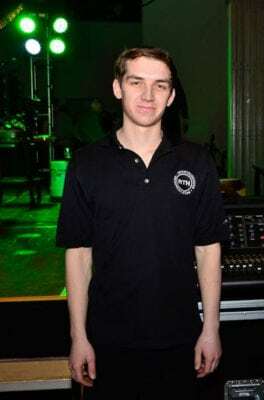 Evan has been with Rock The House for over six years. Since joining the team, he has progressed from working as an audio technician to leading a team. He is willing to lend a hand to anyone in need and strives to make everything around him better. Evan grew up around performance and performed as a kid, but eventually realized that he liked the behind-the-scenes factor more than being on the stage. 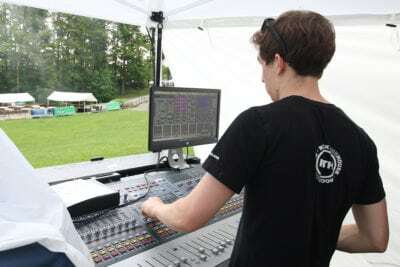 His interest in the technical side of things even led him to study event production. If you could have a superpower, what would it be? I’d like to fly, I hate sitting in traffic. What’s something not many people know about you? I’ve been drinking coffee since I was a little kid. On that note, how do you take your coffee? Black. 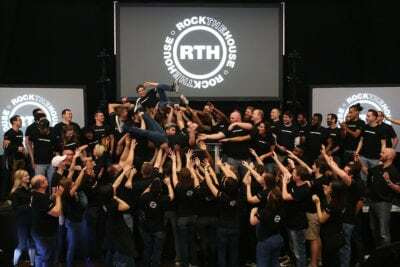 Yep, that’s Evan getting a “lift” from the RTH team! When not at work, Evan can be found working out at the gym, enjoying craft beers, and spending time with his friends and family. Congratulations to Evan on being January’s ROCKstar of the Month! Interested in working with rockstars like Evan to produce your next event? Contact our team of event professionals today to get started! Photos courtesy of the Rock The House Photo Archive.